I've become engrossed in the new book, A World in HDR by Trey Ratcliff, and am now infatuated with HDR photography! Below I'll show just a few examples of what can be accomplished using this technique. High Dynamic Range Imaging is a relatively new technique that allows you to portray a much greater range of tonal detail than a given camera could capture in a single photo. Utilizing technique and leveraging the merge to HDR feature in Photoshop can help you make the most of your photography experience. As shown above, the works of Ruben Seabra, at his Flickr photostream (atrium09). This is one photographer who best illustrates some of the awe-inspiring work you can create using HDR technologies. Unfortunately, Ruben doesn't tell us much about himself, as is typical of Flickr artists. Pemb Dave's photostream on Flickr offers some wonderful HDR photography, along with straight photogralphy from some pretty breathtaking landscapes. You can learn a lot more about high dynamic range Photography at the Wikipedia. And if this dramatic technique appeals to you, then I highly recommend A World in HDR where photography expert Trey Ratcliff shows you just about everything you need to know about this wonderful technique. 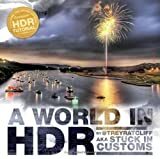 A unique blend of practical and inspirational, this book features a breathtaking collection of HDR photographs along with engaging explanations of how Trey achieved the image. You'll also get foolproof HDR tutorial and software recommendations -- which is essential if you're going to get it right. Very nice pictures I with I had my camera with me when I wan on those carnival cruise ships last year. I'm reading the same book and loving every word of it. The pictures are pretty good too! I love the way Trey thinks and sees. I'm inspired by him. HDR makes complete sense to me. It's the way I see the world. Before HDR photography frustrated me because I couldn't capture what I was seeing, even with advanced Photoshop knowledge and retouching skills. This is a great post that sums up why HDR, when done right is so incredible. My friend who is a photographer and had a workshop to show me these techniques ... they're very cool, but I haven't mastered them yet! Wow, the photos are magnificent. I'd be happy if I could to make such photos. Earlier I didn't like photos as art but now I'm fond of it. I think that the photographers are very attentive, they notice such things which other people fail. I would like to elevate my photograph-taking skills ... There are professional tricks and tips in picture taking that everyone can do. Look and learn about photograhy in this article. I bought the book and WOW ... you're spot on! I love the other selections in this site. Lots of your Photoshop tutorials and advice really eliminates the need for the really recent upgrades, because you are making the image improvements by methods that have been here for a long time! These are great! I love the play on colors and on how they add such drama and depth to the shots. thank you for the wide variations of HDRs! Some time before, I did need to learn these techniques but I did not learn enough so I ordered the book. Thank God ... now I've got it down! Great website, Fred! One of a handful that's really worth browsing through. Keep osting such helpful and informative articles! Fred! I've heard about it but have never really seen any HDR photos. Thank you for sharing such info to your readers!